There has been another fatal crevasse fall on the popular Vallée Blanche route which leads down from the 3800 meter Aiguille du Midi to Chamonix. 80,000 skiers and snowboarders descend the “VB” between December and April. A 29 year old snowboarder fell 15 meters after a snow bridge gave way. According to witness statements taken by the PGHM (High Mountain Police) in Chamonix the boarder was slightly off the track being followed by the rest of his group when he broke through snow covering a crevasse. No-one else in the group had crossed at this point. The man was accompanied by a guide. The accident occurred at 2800 meters above the Requin refuge. The victim was a Russian national. 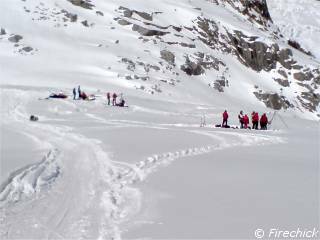 A British snowboarder died after falling into a crevasse on the 2nd of March, 2008 at the Salle a Manger area. On the 13th March a French national was killed by a crevasse fall at 3400 meters. Thanks for posting these cautionary stories, David. Puzzling thing is that just from looking at the reported snow depths, I might have guessed there was now in late March enough snow at higher altitudes like 3400m altitude—or 200cm (over 6 feet) at 2500m in the Mont Blanc massif—to form stable snow bridges. But maybe I’m not analyzing it right. Or maybe the problem more recently is newer thinner weaker bridges formed by wind in recent snowstorms. Which have not had enough time to strengthen in repeated freeze-thaw cycles (or collapse in the next thaw). Two soldiers from the French elite mountain troops have been seriously injured by an avalanche on the west face of the Grand Sorbier above Chamrouse yesterday at 13h15. The accident occurred at 2300 meters altitude. The avalanche risk was between 2 and 3 in the sector at the time of the incident. The men were part of a group of 10 soldiers on a training exercise. Four of the group had already traversed the slope on skis, the fifth was on crampons when a small snow slab of some 30 cm depth took him and another trainee over cliffs. The two men were carried some 100 meters over cliffs and partially buried by the slide. A search is ongoing for a Spanish skier on the Vallee Blanche who has been missing since Thursday. The 38 year old man was last seen shortly before midday at the col du Rognon at 3400 meters. The sector has a number of crevasses. Over a meter of snow has fallen in the area since the man disappeared and hopes of finding him are slim. Good news, the Argentinian (as he turned out to be) was found today in a snow cave having spent two chilly nights at 3500 meters altitude. Fernando Gaspar Estevez Carvajal had mild hypothermia and frost bite. He told journalists that he had fallen into a crevasse. It took him three hours to climb out by which time night was falling. He managed to climb some way towards the Aiguille du Midi but spent the first night in a snow cave he had made. The next day the weather conditions were too bad to make much progress and he sheltered in a new snow cave. He was able to attract the attention of some Italian skiers today who alerted the rescue services. He was close to the col du Flambeau.